It is, the BBC has informed me, Super Saturday. This is because Britain has chances of a massive glut of medals in the pool, in the sailing, at the rowing regatta and in the velodrome. 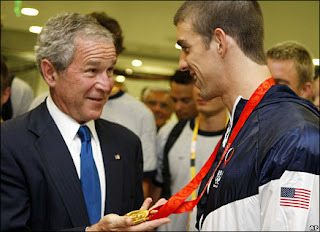 Showing an even-handedness which gladdens the heart, they also included Michael Phelps' Spitzocaust attempt within that. First up was Rebecca Adlington in the 800 metre freestyle swimming. No Briton has ever won two gold medals in the same Olympics, so history was for the taking. She did it too with some style, breaking the World Record and swimming her way into the British public's affections for at least a few more months yet. This much was very clear from the commentary, which became more and more familiar throughout the sixteen lengths. Starting as Ms. Adlington, as she broke clear she became Becky. Becks was not far off, then Adds, Admund, RA and Bea. Had the race been 850 metres, I'm sure that she would have finished the event like Prince, a symbol for a name. Still, she's done a fantastic job and has an enormous nose. Also in the fabulously-named Water Cube, Michael Phelps equalled Mark Spitz's 1972 benchmark of seven golds in one games in the 100m butterfly, but rather less emphatically than for his previous six. Instead of blowing the field away and smashing the World Record, Phelps was embroiled in an epic fight with Serbia's Milorad Cavic. Cavic led all the way, up to and including the 99 metres and 99.8 centimetre mark. Phelps, who has obviously been very busy this week and as such has had no time to cut his fingernails, somehow touched first. I have watched this 3 times now, and I still can't see how his did it. I'll steer clear of saying anything else. Maybe he sloughed off a skin cell from his index finger at just the right time. Seven gold medals in seven days, to go with the 1400 he won in Athens, Michael Phelps is now just one swim away from being BA Baracus. If he's not called Mick on American TV yet, I don't know what more they could possibly want him to do. Well, naturally I'll be watching all the British medal attempts that I can. I'll be starting off with the rowing and sailing, which is like swimming for people who can't swim. But what I'm really looking forward to is the cycling, because it's very exciting stuff. I will report back on what bounced off my retinas and formed brain data later on. If, that is, I'm not completely carried away in a nationalistic frenzy whereby I start to earnestly believe that all foreigners are the scum of the earth. Of course.